Photo by Andy Read. © Andy Read. High Voltage, Copenhagen: 13th of April 2019 at 21:30. Free adminission. Børneteatret at Christiania: Saturday the 18th of September at 20:00. Børneteatret at Christiania: Friday the 10th of August at 21:00. Admission is DKK 30,-. Floor Fusion - Support concert for Børneteateret that needs a new floor. It will be kind of like the concert in May. There will be improvisations and also more known funk-jazz and rock-jazz songs. There will be a jam-session-thingy in the end. Musicians will be announced later, but of course band leader Thomas Thor Ulstrup (piano/keys) will be there. Facebook event. Junglesyre in Børneteatret: Thursday the 31st of May at 22:00. Admission is DKK 30,-. See Facebook event. Svanberg/Bak/Nielsen/Thomassen Quartet: Friday the 19th of November at a company party. Not open to the public. Bak/Nielsen Duo: Thursday the 14th of October at Dansk Arkitektur Center at the opening of the exhibition 'Playing Seriously' in the afternoon. Not open to the public. With Thomas Ulstrup, Metta Kim Carter: Wednesday the 10th of March sometime after 17:00 at a pro-tibet demonstration at Christiansborg in Copenhagen. Bak/Nielsen Jazz Duo: Performance at an opening of an exhibition at Galleri 68, Store Kongensgade 68, 1264 Copenhagen K on friday the 10th of October 2008. Time: 20:30 and 21:30. The exhibition will focus on works of the ukranian artist Serhiy Savchenko who will also be present. Bak/Nielsen Jazz Duo: Closed performance at a reception at Bymuseet, 1620 Copenhagen V on monday the 7th of January 2008. Yup, that's right. Absolutely nothing was going on in 2007. V.O.B. : Saturday the 8th. of July 15:00 (CET) at Musikcaféen, Huset, Rådhusstræde 13, Copenhagen. The concert is part of the program of Copenhagen Jazz Festival 2006. With Alex Puddu and the Butterfly Collectors + support Sophie Dornoy at Pitstop in Kolding saturday the 11th of February 21:00 (CET) 2006. With Alex Puddu and the Butterfly Collectors + support Sophie Dornoy at Studenterhuset in Aalborg friday the 10th of February 21:00 (CET) 2006. With Alex Puddu and the Butterfly Collectors + support Sophie Dornoy at Fabrikken in Århus saturday the 21th of January 00:00 (CET) 2006. With Alex Puddu and the Butterfly Collectors + support Sophie Dornoy at Stengade 30, Copenhagen friday the 13th of January 22:00 (CET) 2006. With Alex Puddu and the Butterfly Collectors + support Sophie Dornoy at Helligåndskirken, Copenhagen friday the 4th of November 20:00 (CET) 2005. With V.O.B. : Friday the 7th of October 21:00 (CET) 2005 at Café Utopia, Vesterbrogade 200, in Copenhagen (bus 18, 26 and 6A, near Pile Allé/Vesterbrogade). We will play our jazzy tunes, mostly original compositions. With Alex Puddu and the Butterfly Collectors + support Sophie Dornoy at Rust, Copenhagen thursday the 6th of October 21:30-22:15 (Sophie Dornoy) and 22:30-24:00 (Alex Puddu) (CET) 2005. With Alex Puddu and the Butterfly Collectors at Cafe Tjili Pop in Copenhagen (Denmark) saturday the 14th of May at 21:00 (CET) 2005. With V.O.B. : Friday the 11th of March 22:00 (CET) 2005 at Café Stalingrad (Stengade 30), Stengade 18, in Copenhagen (bus 3 and 5A near Stengade/Nørrebrogade). V.O.B. will play the jazzy tunes in latin style. With Alex Puddu and the Butterfly Collectors at Studenterhuset in Aalborg (Denmark) friday the 25th of February at 22:00 (CET) 2005. Tickets at 70 DKK. It will be a double-concert with Dynamoe. With V.O.B. : Latin Night! Saturday the 19th of February 21:30 (CET) 2005 at Café Utopia, Vesterbrogade 200, in Copenhagen (bus 18, 26 and 6A, near Pile Allé/Vesterbrogade). We will play our normally jazzy tunes in a samba/latin way - very cool and fun! With Alex Puddu and the Butterfly Collectors in Copenhagen friday the 1st of October at the record store "GUF" Nørrebrogade, 18:00-18:30 - yes, it is more promotion than a real concert. Jam: Friday the 3rd of September 2004 22:00 at Stengade 30/Stalingrad in Copenhagen, Denmark. With Alex Puddu and the Butterfly Collectors at Rust, Copenhagen friday the 9th of July 21:00 2004. The concert is a part of the program of Copenhagen Jazzfestival 2004. Chrome Shift: Live at Tex in Copenhagen on the 27th of February 2004 at 24:00 hours. Chrome Shift: At Månen in Haderslev, Denmark friday the 14th of November 2003. 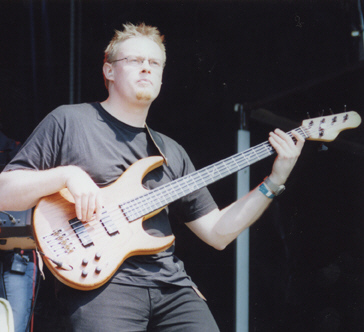 Chrome Shift: At the Progpower Festival in Baarlo, Holland on the 4th of October 2003 at 15:05-16:00. Chrome Shift: At Sweden Rock Festival the 8th of June 2003 at 11:50-12:30! Chrome Shift: Live at Tex in Copenhagen on the 22nd of February 2003 at 24:00 hours. Chrome Shift: 3rd of August 2002 at Mosstock Festival, Skanderborg in Denmark from 21:30-22:30. Epifani: 9th. of July 2002 at Det Kgl. Danske Haveselskab, 2000 Frederiksberg, Denmark. From 15:00-16:00 hours. The concert is a part of the program of Copenhagen Jazzfestival 2002. Chrome Shift: 25th of May 2002 at Stubrock, Stubbæk near Aabenraa in Denmark. 21:40 to 22:25. Epifani: 11th. of April 2002 at Ama'r Spot, Krunch, Øresundsvej 14, 2300 Kbh. S, Denmark. Sometime after 20:30 hours. We will be playing for half an our.